On Saturday I once again schlepped up to the mighty metropolis of Bournemouth for the (bi-annual?) Film & Comic Con… and had a very lovely time there, thank you for asking. My first stop (after the loos, obviously) was the Beano table, where artist Nigel Parkinson was dishing out badges and drawing marker-pen sketches, which were then handed over to Nika Nartova for some expert colouring. 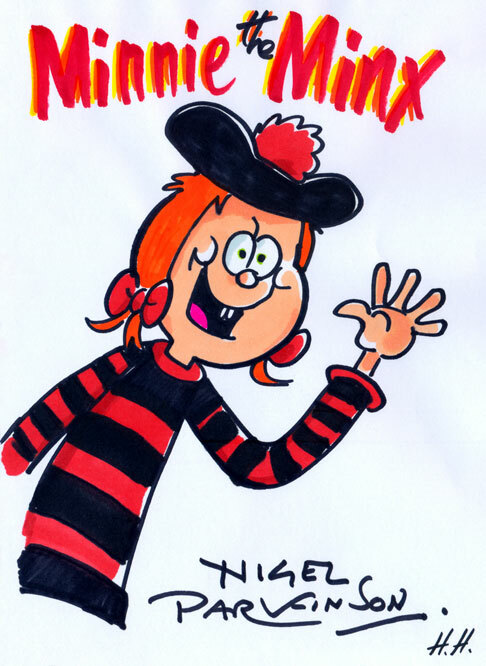 Naturally I requested the comic’s trouble-making tomboy Minnie the Minx… who (according to Wikipedia) was created by Leo Baxendale way back in 1953, presumably making her the longest running female headliner in British comics? Crikey! Nigel and Nika were both very friendly, and it was fascinating to watch them work, and chat with them about their processes. As you can see from this scan, the finished piece they produced is pretty darn adorable… and dig the three-tone shading! 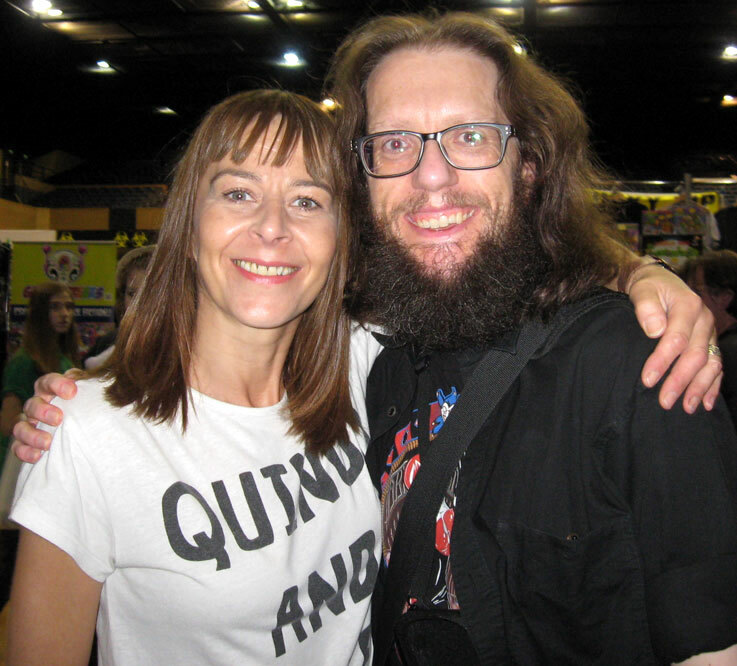 Of course, the star attraction of the convention for me was Kate Dickie… though it did take a couple circuits (and a lunch break) to summon up the courage to approach her table. In retrospect, I’ve no idea what I was so nervous about, because she proved to be one of the most welcoming people you could ever hope to meet. Apparently she’d travelled all the way from Glasgow the day before… which is a seven hour drive at best, so bless her for that. After much deliberation, I plumped for a photograph from The Witch to get signed, and she’s clearly very proud of the film, as she explained the painstaking research that Robert Eggers conducted prior to production, and the care he’d taken over authentic period details… even down to the wool used in the socks they were wearing! Fun fact: According to IMDb, Dickie made her screen debut in the Scottish sitcom Rab C. Nesbitt (ep #4.2), playing a gold-toothed ‘Young Girl’ hanging out of the window of a local lothario’s van. By a wacky co-inky-dink, this was the very same episode that saw Mabel Aitken making her first credited on-screen appearance… so I thought I might take a chance and ask Dickie if they knew each other. Apparently the Scottish acting community is quite close-knit, so it wasn’t quite as silly a question as it might sound… but she doesn’t know Aitken socially, no. She did agree that she’s a very good actress though, and we both hope to see her performing again soon. Please and thank you. As for Dickie’s own upcoming projects, I’m really looking forward to Prevenge (2016), a “post-feminist revenge movie” written and directed by Alice Lowe, who also stars alongside Kayvan Novak and Gemma Whelan. In-between all this hobnobbing, I was trawling the stalls, and picked up several bargains… including a seven-issue run of L.E.G.I.O.N. ’89 for just £1 all-in! Score. It was also rather heart-warming to overhear young neophytes admitting to sellers that they’d never bought a comic book before, but really loved such-and-such a movie, and wanted to check out more of the characters’ adventures in print form. One lad even compared himself to ‘Leonard’ from The Big Bang Theory as he leafed through a long-box for the first time… thus underlining how ubiquitous (and mainstream) Geekiness has become since I was their age, stumbling blindly into dark/stinky comic stores without any famous sitcom stars to emulate… I mean, yes, I did have ‘Brodie’ from Mallrats to look up to… but he didn’t set a particularly responsible (or attainable) example, did he? This entry was posted in Rants about Art, Rants about Comics, Rants about Films, Rants about TV and tagged A New-England Folktale, Alice Lowe, Film & Comic Con Bournemouth, Gemma Whelan, Ideal, Kate Dickie, Kayvan Novak, Leo Baxendale, Mabel Aitken, Mallrats, Minnie the Minx, Nigel Parkinson, Nika Nartova, Prevenge, Rab C. Nesbitt, Robert Eggers, The Beano, The Big Bang Theory, The VVitch, The Witch. Bookmark the permalink.